In home delivery by Friday, Dec. 6 Kick off the Christmas season with Winter Springs 32nd annual Holiday Parade and Tree Lighting this weekend! MORE IN CALENDAR, PAGE 3 WHERE TO FIND THE BEST GOATSINTERESTS, 4Knights could win it allUCF football hits the gridiron season, hoping to clinch. ATHLETICS, 8Keep your brain healthy FUN AND GAMES, 11On the anniversary of the Pearl CENTRAL FLORIDA SENIOR, B1CALENDAR . . . . . . . . . ..................... 3 INTERESTS . . . . . . . . . ..................... 4 CULTURE . . . . . . . . . . ...................... 6 ATHLETICS . . . . . . . . . ..................... 8 VOICES . . . . . . . . . . ....................... 10 CLASSIFIEDS . . . . . . . . ................... 11 CENTRAL FLORIDA SENIOR . . . ........ B1 MARK YOUR CALENDARTears brimmed in Cheryl and Richard Gonzales eyes as three solemnly spoken words helped to three on Nov. 22. Evans. The words marked an end beginning to their new life as parents as their new smiling happily back to his seat behind them. went from one of ongoing worry two stable parents. said. work of the people at Childrens of them for helping make this stead became places of celebra tion on Nov. 22 for families like the Gonzales. In honor of Novembers before the holidays. room was transformed into a friends and relatives who were there to celebrate with them. eyed looks of wonder as new families glanced at each other teddy bears and cake took the stenographers. Weve been a family something changed today. Were this milestone. They worked relearning how to parent. as grandparents formally adopt ing grandchildren or in the case was grinned over the top of her night to start the search for a Oviedo Center Park the center piece of the Oviedo on the Park attractions. est and tallest cypress tree that half of this year. Its been part of the overall plan ever since. I think it was a really cool Persampiere said. We are all have it here is really something The arrangements have piece of the family park area iere said. The planting of the Senator clone is a reversal of a trend in development on forest and agri Oviedo on the Park is being were leveled in order to create city has recently drawn the ire of residents in the bordering allowing zoning changes to land which has led to the clearing of developments along the citys northeastern borders. The Senators clone came preserve the Senator before its Florida forest genetics researcher Don Rockwood. In a grove in Americas hardiest trees for more Christmas wish granted: a new homeOviedos growing tributeALLISON OLCSVAY The Voice TIM FREED The VoiceKids across Central their forever families on National Adoption Day city will plant copy of an ancient treePHOTO BY ALLISON OLCSVAY Jayden Gonzales, 10, embraces adoptive parents Richard and Cheryl at a National Adoption Month event that made their family ofcial on Nov. 22. PHOTO BY ISAAC BABCOCK THE VOICE A clone of The Senator tree rises at Big Tree Park in Longwood. 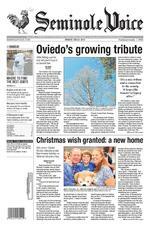 Oviedo will soon have another, planted on ground where an orange grove was bulldozed. Please see ADOPTION on page 3 Please see TREE on page 2 Its a nice tribute and a connection to the county. It keeps [the Senators] legacy alive. Page 2 | Dec. 6, 2013 | Seminole Voice THIS WEEK THIS WEEK IN WORLD HISTORY DEC. 12, 1901 Italian physicist and radio pioneer Guglielmo rffrntbrbtrbrtr rr btr r r r nbbrr nbbrr nbbrr nbbrr nbbrr nbbrr nbbrr nbbrr nbbrr nbbrr nbbrr nbbrr nbbrr nbbrr nbbrr nbbrr nbbrr nbbrr nbbrr nbbrr nbbrr nbbrr nbbrr nbbrr nbbrr nbbrr nbbrr nbbrr nbbrr nbbrr nbbrr nbbrr nbbrr nbbrr nbbrr nbbrr Family Fun Event sponsored by Family Fun Event sponsored by Friday, Dec. 6, 2013 Volume 23, Issue 49 PHONE: 407-563-7000 FAX: 407-563-7099 SEMINOLEVOICE.COMOrlando, FL 32835-5705PUBLISHERTracy Craft407.515.2605TCraft@TurnstileMediaGroup.com Isaac Babcock 407.563.7023IBabcock@TurnstileMediaGroup.comASSOCIATE EDITORSarah Wilson 407.563.7026SWilson@TurnstileMediaGroup.comTom Miller 407.563.7032TMiller@TurnstileMediaGroup.comSTAFF WRITERSBrittni Larson Megan Stokes Tim Freed Allison Olcsvay Kristy VickeryCOLUMNISTSJanet Foleyjwfoley75@gmail.comSandi VidalSandi@ChristianHelp.orgTom CareySundewGardens@gmail.comKaren PhillipsKarenMPhillips@bellsouth.netJosh GarrickJoshGarrick9@gmail.comDeborah Sheehy 407.563.7009DSheehy@TurnstileMediaGroup.comAshley McBride 407.286.0807Legal@FLALegals.comSUBSCRIPTIONS/CIRCULATIONLuana Baez 407.563.7013LBaez@TurnstileMediaGroup.comMEMBER OF: Florida Press Association Oviedo-Winter Springs Regional Chamber of CommerceTURNSTILE MEDIA GROUPCHAIRMANRance CrainPRESIDENT/CEOFrancis X. FarrellVICE PRESIDENTSPatti Green & Jeff BabineauUSPS #008-093Periodicals postage is paid at Oviedo, Fla.POSTMASTER: Send address changes to:Seminole Voice, 1500 Park Center Drive Orlando, FL 32835 independently of the newspaper. 2013 rfnftbf D ecember 19th-22ndBob Carr Performing Arts Centre ORLANDO PHILHARMONIC ORCHESTRA BOOK YOUR SEATS TODAY !407-426-1739O RLAND OBA LLET.ORG rffttbf* Price does not include tickets to The Nutcracker performance. photocarlos amoedo | focustudios.com At least two clones have been since then one located at Big Tree Park near the remains of miles away. Now that Oviedo will have Stephen Schenck said the city day. said. It keeps the legacy alive and helps spread the legacy I think thats what they want to do with those saplings: make them accessible and spread the Land developer Tom Cavana TREE | Oviedos new tree will be rare clone of The Senator, a 3,500 year old Cypress CONTINUED FROM FRONT PAGE ARCHIVE PHOTO BY ISAAC BABCOCK Hundreds gathered to pay respects to The Senator in March during a dedica tion ceremony to one of its successors, a clone called The Phoenix, planted nearby. Seminole Voice | Dec. 6, 2013 | Page 3 FAMILY CALENDAR rf nnrtb rrrfnNO PURCHASE NECESSARY. AVAILABLE NOVEMBER 26 ON DIGITAL HD ON BLU-RAYTM COMBO PACK & DVD DECEMBER 10 ENTER FOR YOUR CHANCE TO WIN A BLU-RAY COMBO PACKSend us your name and mailing address to tcraft@turnstilemediagroup.comNO PURCHASE NECESSARY. tion that shed never have to leave the began to set in. two front teeth. Im gonna tell all my share a home and the responsibilities of raising their grandchildren. had been craving. to leave me. This way she never has to Peggi Smith of Altamonte Springs also call home. Aaliyah has been with me since day one and now its a blessing to know that ness felt going forward for all those in her shoes. It makes me feel happier to be part of It makes me feel happy and warm inside family. adopted children who had been placed in their care initially as foster children. The process to become foster parents are matched with children in need of stable environments. they are expected to need foster care. mom will never forget it. Downs is a single mom whos been a foster parent for two kids. she said. Dressed smartly for the occasion in a excited to be a permanent part of his life as He doesnt know what this all means ADOPTION | Dozens of kids get forever homes CONTINUED FROM FRONT PAGE DEC. 6-7 St. Lukes Concert Series returns with the 2013 Holiday Concert featuring the Brass Band of Central Florida, with three performances Friday at 7 p.m. and Saturday at 2 p.m. and 7 p.m. Admission is free for this concert, directed by Chad Shoopman with a delightful program of holiday favorites. Arrive early for the 2 p.m. Saturday showing and enjoy the Holiday Gift Fair from 9 a.m. to 2 p.m. with dozens of delight ful craft and gift booths. Its all at St. Lukes Lutheran Church at 2021 W. State Road 426 in Oviedo. Visit stlukes-oviedo.org for more information. DEC. 6-15The villainous Barnaby has fallen in love with sweet Mistress Mary Quite Contrary. If he cant buy her love, then hell force her to marry him by threatening to foreclose on her mother, the poor widow Piper. Mary already has her heart set on marrying Barnabys nephew Alan but not if Barnaby can help it! Its Babes in Toyland at the Princess Theater, 115 W. First St. in Sanford. Its playing at 7:30 p.m. Friday and Saturdays and 2 p.m. Sundays. Visit spotlightc. org for more information. DEC. 7Celebrate the season with one of the longest tradi tions in Winter Springs, the 32nd annual Holiday Pa rade. Following the parade is the 10th annual Christ mas Tree Lighting. Free pictures with Santa and great holiday-themed performances from local schools, performing arts groups and more. Its all from 5 to 9 p.m. Dec. 7 at the Winter Springs Town Center. Mrs. Claus will be at The Rural Heritage Center for an evening of decorating cookies, making Christmas tree ornaments, writing letters to Santa, and many other fun crafts. Its from 6 to 8 p.m. Dec. 7 and free and open to the public. Its at 101 E. Main St., Geneva. Call 407-792-0758 or visit RuralHeritageCenter.net for more information. DEC. 9Come join the Oviedo Winter Springs Chamber at the Holiday Social from 5 to 7 p.m. Dec. 9 at Spill Wine Bar at 1196 Tree Swallow Drive, suite 1313, in Winter Springs. The $10 admission gets one drink ticket and an appetizer wristband. Contact Melissa Lee at 407278-4872 for more information. DEC. 13Casselberrys ofcial tree lighting ceremony and holiday movie in the park starts at 6 p.m. Dec. 13 at 95 Triplet Lake Drive at Lake Concord Park. Holiday entertainment will delight visitors from 6 to 7 p.m. followed by a tree lighting at 7 p.m., then the movie in the park, Rise of the Guardians will run from 7:30 to 9:30 p.m. Bring the family for Santa, artisan booths, a Food Truck Bazaar and more! For more information call 407-262-7700, ext. 1507. DEC. 14Its the Oviedo Winter Springs Holiday Parade and Snow Mountain! The parade gets going along Ovie do Mall Boulevard at 4 p.m. heading toward the mall, and the Snow Mountain plus games, music and more wait at the end. Its from 3:30 to 9 p.m. Dec. 14 at the Oviedo Mall parking lot, so theres plenty of parking. ONGOINGThe Emil Buehler Perpetual Trust Planetarium at Seminole State College offers Central Florida the chance to celebrate the holidays with multiple perfor mances of its most popular show. The Planetarium will present The Star of Bethlehem 10 times this season, with two showings each on Dec. 6, Dec. 7, Dec. 13, Dec. 20 and Dec. 21. Show times for each date are 7 p.m. and 8:30 p.m. The Star of Bethle hem looks at how the calendar system has changed over the millennia and examines clues from the Bible to pin down the birth year of Jesus under our current calendar. The origins of the Magi are then looked at to determine what celestial phenomena they would have most likely interpreted to be the Star. Light Up UCF runs through Jan. 5, the event features 50 nights of music, lights, and ice, with ice-skating, ice slide, and a winter carnival atmosphere. Visit ligh tupucf.com for more information and tickets. Page 8 | Dec. 6, 2013 | Seminole Voice AAtT HLEt T Ic C S THIS WEEK IN SPORTS HISTORY DEC. 7, 1980 Upcoming Events For more info and to register for events go to: www.OviedoWinterSprings.org December 9th Young Executives Holiday Social 5:30 7:30pm, Spill Wine & Beer in Winter Springs Are you a young executive under 40? Are you currently looking for new networking opportunities? Come join this unique opportunity to network and mingle with young C Level executives. This month we will be hosting a Holiday Social. Our speaker is Esther Vargas Davis from the UCF Incubator program. December 11th OBN Holiday Party 5:30 8:00pm, Tuscawilla Country Club Join the ladies of Oviedo Businesswomen's Network for their Annual Holiday Party! The ladies will celebrate the evening with plenty of dancing and Christmas in the City. December 14th Snow Mountain and Holiday Parade 1700 Oviedo Mall Blvd Oviedo FL 32765 Join us in celebrating the season at the OWS Chamber Holiday Parade! Enjoy marching bands, floats, dance groups, choirs, vehicles and then visit the Snow Mountain! Parade will start at 4:00pm and Snow Mountain will be open until 9:00pm. We hope to see you there! December 19th Chamber Knight at Light Up UCF Join the Chamber at this years Light Up UCF event. Light Up UCF is a great family event with an 8,000 sq ft out door skating rink, rides, and holiday attractions. This year it is snowing every night and they will be showing a different holiday film each night! We hope to see you there, and make sure to stop by our info tent! For Tickets Call 321.268.1125 Or Visit www.TitusvillePlayhouse.com Presented through special arrangement with Tams Witmark, NYC The Knights are at their highest ranking of the season after yet Nov. 29. in a chilly thriller in the Bright driving deep into UCF territory pass and sent the tense crowd accompanied by a collective sigh of relief in a game in which the USFs scores. OLeary said in a press conference after the game. It had had won a game in which they highest the team has ever been the same week the BCS standings slowly moved their way into Their slow and steady rise has games this season in which they were the favorite or the heavy attempts against rival USF was than expected Nov. 29 as the UCF UCF ghts to clinch rst BCS bowl berthISAAC BABCOCK The Voice Please see KNIGHTS on next page PHOTOS BY ISAAC BABCOCK THE VOICE The Knights barely edged USF in their last game, but clinched a share of the AAC title. With a win over SMU this weekend, theyll head to a BCS bowl. Page 7 Lets face it too much of the coverage we provide from Washington is inside base ball, easily ignored by those who live in the real world. Sometimes, though, this stuff matters. A case in point is the decision by Harry Reid and his Democratic gaggle to invoke the nuclear option. Its called that because Reid and his partisan majority blew up ing a parliamentary maneuver, they were able to circumvent the usual two-thirds vote nec essary to change the rules and used a simple majority to do away with the biggest delaying the deliberative United States Senate. Republicans are having a cow. Youll regret this, sput tered Minority Leader Mitch McConnell. The solution to this problem is at the ballot box. He was trying to make the obvious point that if the Rs take over, its the Ds who will have lost their power to stop a conservative agenda. Unwittingly, however, McConnell was offering a justi a stalling tactic that he and his partisans were using to thwart the winner of the last election. The voters choose who will head the nation. Last time around, that was Barack Obama, meaning he gets to on the federal bench, and also who will head the departments and agencies of his adminis tration. Forgive the civics refresher, but while the Constitutions advise-and-consent power provides the Senate an abil ity to block nominees, it is supposed to be used sparingly. The key word is consent, but at an unprecedented level, the judicial and executive appoint ments put forth by President Obama. It came to a head when they blocked three of his openings. The Republicans were daring Reid to make the nuclear move in truth, they triple-dared him so he did. Actually, it wasnt a com is an exception for the Su preme Court nominees, and it still can be deployed to shut down legislation. That brought some criticism from those who believe that the GOP agenda is all about obstruc tion. If Barack Obama asked Congress to approve a Happy Thanksgiving resolution, it upper chamber. Republicans vow revenge. They have plenty of tools for continuing the gridlock. The Senate rules are packed with delaying tactics. So they can retaliate against the nuclear option with the death of a thousand cuts. The budget deals that need to be done, for instance, can be sunk if they simply refuse to negotiate. Depending on how vindictive they choose to be, we could be facing another govern ment shutdown or debt-ceiling crisis. If youre wondering just what all this has to do with running the country, the answer is nothing. Those on the right point out that when theyve held the power, the liberals have also embraced procedural block ades. But the Republicans have reached new highs. Or would it be lows? In the ugly world of politics, things rarely improve they get worse. Inside baseball? Yes, it is, but the game affects all of us. If the legislative branch can substitute political pettiness for law making, we will con tinue to deteriorate. Thats not what a democracy is supposed to be. 2069 Aloma Ave. Winter Park, FL 32792 762 E. Altamonte Drive Altamonte Springs, FL 32701(407) 691-3009 (407) 679-2135 Visit us on the web @ www.binsons.com r fntbt f rtt ftbt bt bnr nr rt b bb f b tb off trtnCoupon redeemable for cash, check or credit card purchases only. Not redeemable for insurance transactions. Excludes custom/special orders & nutritional supplements. May not be combined with any other discounts. Coupon has no cash value. New Holiday Merchandise! Nuclear matters: War on the Capitol oor ASSISTED LIVING RESIDENCE 395 Alafaya Woods Blvd., Oviedo, FL 32765 407-977-8786ALF License No. 9235, 9308, 9307 www.slm.net/SCOviedo1 Signature property of Located on a beautiful campus setting, our two Savannah Court communities provide full assisted living services while Savannah Cottage offers a secured residence for those with memory loss. Call us today, stop by for a visit, join us for lunch, or all of the above! You are always welcome at Savannah Court and Cottage of Oviedo. MEMORY CARE RESIDENCEWhere hospitality is truly a way of life! Savannah Court and Cottage ASSISTED LIVING RESIDENCE 395 Alafaya Woods Blvd., Oviedo, FL 32765 407-977-8786ALF License No. 9235, 9308, 9307 www.slm.net/SCOviedo1 Signature property of Located on a beautiful campus setting, our two Savannah Court communities provide full assisted living services while Savannah Cottage offers a secured residence for those with memory loss. Call us today, stop by for a visit, join us for lunch, or all of the above! You are always welcome at Savannah Court and Cottage of Oviedo. MEMORY CARE RESIDENCEWhere hospitality is truly a way of life! Savannah Court and Cottage Located on a beautiful campus setting, our two Savannah Court communities provide full assisted living services while Savannah Cottage offers a secured residence for those with memory loss. You are always welcome at Savannah Court and Cottage of Oviedo www.savannahcourtoviedo.com395 Alafaya Woods Blvd., Oviedo, FL 32765407-977-8786 Call us today, stop by for a visit, join us for lunch, or all of the above! Page 8 DEAR PAWS CORNER: I have two dogs and a cat, and I love them all dearly. I also try to make things a little better for pets that dont have homes by helping out two days a month at the local shelter. Please let your read ers know that they can make a huge difference in dogs and cats lives even with a small contribution. If they cant give their time, they can donate money, food or other pet-care items. Caring in Kalamazoo DEAR KALAMAZOO: You told them, and thanks! The holiday season offers the most opportunities to donate, no matter what amount, to a pets. So while youre busy making gift lists and holiday preparations, dont forget to include pets in need some where in those thoughts. Most local shelters have Web pages online where you fundraising events, see what food or supplies are needed, email address to learn more. Those that dont have a website often have listings or dedicated space in the town or community newspaper. Major pet-care organiza tions and pet-supply stores have fundraising drives throughout the year, while local organizations sometimes hold supply drives and other events with the help of local businesses or municipalities. You also can donate your free time to help out at local animal shelters. Contact your nearest shelter to see if op portunities are available, how much time is required and if additional training is needed for certain volunteer posi tions. Send your questions or comments to ask@pawscorner.com. Did you know mosquitos can transmit heartworm lar vae to dogs, but eas dont? Find out more in my new book, Fighting Fleas, available now. 2013 King Features Synd. Inc.Remember pets in need this holiday season will be celebrating mass starting at1300 N. Mills Ave.(Mills and Montana, just north of Colonial Dr.)Mass begins at 11 a.m. Casual attireParking is along Mills and in Watkins Dental parking lot. Please visit website for information HEAR YE ... HEAR YE! shadow.indd 1 5/1/12 3:22 PM shadow.indd 1 5/1/12 3:22 PM shadow.indd 1 5/1/12 3:22 PM here should be more to life than maintenance-free living. To learn more about our community in Kissimmee, call (407) 933-1999. In home delivery by Friday, Dec. 6 Kick off the Christmas season with Winter Springs 32nd annual Holiday Parade and Tree Lighting this weekend! MORE IN CALENDAR, PAGE 3 WHERE TO FIND THE BEST GOATS INTERESTS, 4 Knights could win it all UCF football hits the gridiron season, hoping to clinch. ATHLETICS, 8 Keep your brain healthy FUN AND GAMES, 11 On the anniversary of the Pearl CENTRAL FLORIDA SENIOR, B1 CALENDAR .................... 3 INTERESTS .................... 4 CULTURE ..................... 6 ATHLETICS .................... 8 VOICES ...................... 10 CLASSIFIEDS .................. 11 CENTRAL FLORIDA SENIOR ....... B1 MARK YOUR CALENDAR Tears brimmed in Cheryl and Richard Gonzales eyes as three solemnly spoken words helped to three on Nov. 22. Evans. The words marked an end beginning to their new life as parents as their new smiling happily back to his seat behind them. went from one of ongoing worry two stable parents. said. work of the people at Childrens of them for helping make this stead became places of celebra tion on Nov. 22 for families like the Gonzales. In honor of Novembers before the holidays. room was transformed into a friends and relatives who were there to celebrate with them. eyed looks of wonder as new families glanced at each other teddy bears and cake took the stenographers. Weve been a family something changed today. Were this milestone. They worked relearning how to parent. as grandparents formally adopt ing grandchildren or in the case was grinned over the top of her night to start the search for a Oviedo Center Park the center piece of the Oviedo on the Park attractions. est and tallest cypress tree that half of this year. Its been part of the overall plan ever since. I think it was a really cool Persampiere said. We are all have it here is really something The arrangements have piece of the family park area iere said. The planting of the Senator clone is a reversal of a trend in development on forest and agri Oviedo on the Park is being were leveled in order to create city has recently drawn the ire of residents in the bordering allowing zoning changes to land which has led to the clearing of developments along the citys northeastern borders. The Senators clone came preserve the Senator before its Florida forest genetics researcher Don Rockwood. In a grove in Americas hardiest trees for more Christmas wish granted: a new home Oviedos growing tribute ALLISON OLCSVAY The Voice TIM FREED The Voice Kids across Central their forever families on National Adoption Day city will plant copy of an ancient tree PHOTO BY ALLISON OLCSVAY Jayden Gonzales, 10, embraces adoptive parents Richard and Cheryl at a National Adoption Month event that made their family ofcial on Nov. 22. PHOTO BY ISAAC BABCOCK THE VOICE A clone of The Senator tree rises at Big Tree Park in Longwood. Oviedo will soon have another, planted on ground where an orange grove was bulldozed. Please see ADOPTION on page 3 Please see TREE on page 2 Its a nice tribute and a connection to the county. It keeps [the Senators] legacy alive. Page 2 | Dec. 6, 2013 | Seminole Voice THIS WEEK THIS WEEK IN WORLD HISTORY DEC. 12, 1901 Italian physicist and radio pioneer Guglielmo rffrntbrbtrbrtr rr btr r r r nbbrr nbbrr nbbrr nbbrr nbbrr nbbrr nbbrr nbbrr nbbrr nbbrr nbbrr nbbrr nbbrr nbbrr nbbrr nbbrr nbbrr nbbrr nbbrr nbbrr nbbrr nbbrr nbbrr nbbrr nbbrr nbbrr nbbrr nbbrr nbbrr nbbrr nbbrr nbbrr nbbrr nbbrr nbbrr nbbrr Family Fun Event sponsored by Family Fun Event sponsored by Friday, Dec. 6, 2013 Volume 23, Issue 49 PHONE: 407-563-7000 FAX: 407-563-7099 SEMINOLEVOICE.COM Orlando, FL 32835-5705 PUBLISHER Tracy Craft 407.515.2605 TCraft@TurnstileMediaGroup.com Isaac Babcock 407.563.7023 IBabcock@TurnstileMediaGroup.com ASSOCIATE EDITOR Sarah Wilson 407.563.7026 SWilson@TurnstileMediaGroup.com Tom Miller 407.563.7032 TMiller@TurnstileMediaGroup.com STAFF WRITERS Brittni Larson Megan Stokes Tim Freed Allison Olcsvay Kristy Vickery COLUMNISTS Janet Foley jwfoley75@gmail.com Sandi Vidal Sandi@ChristianHelp.org Tom Carey SundewGardens@gmail.com Karen Phillips KarenMPhillips@bellsouth.net Josh Garrick JoshGarrick9@gmail.com Deborah Sheehy 407.563.7009 DSheehy@TurnstileMediaGroup.com Ashley McBride 407.286.0807 Legal@FLALegals.com SUBSCRIPTIONS/CIRCULATION Luana Baez 407.563.7013 LBaez@TurnstileMediaGroup.com MEMBER OF: Florida Press Association Oviedo-Winter Springs Regional Chamber of Commerce TURNSTILE MEDIA GROUP CHAIRMAN Rance Crain PRESIDENT/CEO Francis X. Farrell VICE PRESIDENTS Patti Green & Jeff Babineau USPS #008-093 Periodicals postage is paid at Oviedo, Fla. POSTMASTER: Send address changes to: Seminole Voice, 1500 Park Center Drive Orlando, FL 32835 independently of the newspaper. 2013 rfnftbf D ecember 19th-22ndBob Carr Performing Arts Centre ORLANDO PHILHARMONIC ORCHESTRA BOOK YOUR SEA TS T ODAY !407-426-1739O RLA N D OBA LLET.ORG rffttb f* Price does not include tickets to The Nutcracker performance. photocarlos amoedo | focustudios.com At least two clones have been since then one located at Big Tree Park near the remains of miles away. Now that Oviedo will have Stephen Schenck said the city day. said. It keeps the legacy alive and helps spread the legacy I think thats what they want to do with those saplings: make them accessible and spread the Land developer Tom Cavana TREE | Oviedos new tree will be rare clone of The Senator, a 3,500 year old Cypress C ONTINUED FROM FRONT PAGE ARCHIVE PHOTO BY ISAAC BABCOCK Hundreds gathered to pay respects to The Senator in March during a dedica tion ceremony to one of its successors, a clone called The Phoenix, planted nearby. Seminole Voice | Dec. 6, 2013 | Page 3 FAMILY CALENDAR rf nnrtb rrrfnNO PURCHASE NECESSARY. AVAILABLE NOVEMBER 26 ON DIGITAL HD ON BLU-RAYTM COMBO PACK & DVD DECEMBER 10 ENTER FOR YOUR CHANCE TO WIN A BLU-RAY COMBO PACKSend us your name and mailing address to tcraft@turnstilemediagroup.comNO PURCHASE NECESSARY. tion that shed never have to leave the began to set in. two front teeth. Im gonna tell all my share a home and the responsibilities of raising their grandchildren. had been craving. to leave me. This way she never has to Peggi Smith of Altamonte Springs also call home. Aaliyah has been with me since day one and now its a blessing to know that ness felt going forward for all those in her shoes. It makes me feel happier to be part of It makes me feel happy and warm inside family. adopted children who had been placed in their care initially as foster children. The process to become foster parents are matched with children in need of stable environments. they are expected to need foster care. mom will never forget it. Downs is a single mom whos been a foster parent for two kids. she said. Dressed smartly for the occasion in a excited to be a permanent part of his life as He doesnt know what this all means ADOPTION | Dozens of kids get forever homes C ONTINUED FROM FRONT PAGE DEC. 6-7 St. Lukes Concert Series returns with the 2013 Holi day Concert featuring the Brass Band of Central Florida with three performances Friday at 7 p.m. and Saturday at 2 p.m. and 7 p.m. Admission is free for this concert, directed by Chad Shoopman with a de lightful program of holiday favorites. Arrive early for the 2 p.m. Saturday showing and enjoy the Holiday Gift Fair from 9 a.m. to 2 p.m. with dozens of delight ful craft and gift booths. Its all at St. Lukes Lutheran Church at 2021 W. State Road 426 in Oviedo. Visit stlukes-oviedo.org for more information. DEC. 6-15 The villainous Barnaby has fallen in love with sweet Mistress Mary Quite Contrary. If he cant buy her love, then hell force her to marry him by threatening to foreclose on her mother, the poor widow Piper. Mary already has her heart set on marrying Barnabys nephew Alan but not if Barnaby can help it! Its Babes in Toyland at the Princess Theater, 115 W. First St. in Sanford. Its playing at 7:30 p.m. Friday and Saturdays and 2 p.m. Sundays. Visit spotlightc. org for more information. DEC. 7 Celebrate the season with one of the longest tradi tions in Winter Springs, the 32nd annual Holiday Pa rade Following the parade is the 10th annual Christ mas Tree Lighting. Free pictures with Santa and great holiday-themed performances from local schools, performing arts groups and more. Its all from 5 to 9 p.m. Dec. 7 at the Winter Springs Town Center. Mrs. Claus will be at The Rural Heritage Center for an evening of decorating cookies, making Christmas tree ornaments, writing letters to Santa, and many other fun crafts. Its from 6 to 8 p.m. Dec. 7 and free and open to the public. Its at 101 E. Main St., Geneva. Call 407-792-0758 or visit RuralHeritageCenter.net for more information. DEC. 9 Come join the Oviedo Winter Springs Chamber at the Holiday Social from 5 to 7 p.m. Dec. 9 at Spill Wine Bar at 1196 Tree Swallow Drive, suite 1313, in Winter Springs. The $10 admission gets one drink ticket and an appetizer wristband. Contact Melissa Lee at 407278-4872 for more information. DEC. 13 Casselberrys ofcial tree lighting ceremony and holiday movie in the park starts at 6 p.m. Dec. 13 at 95 Triplet Lake Drive at Lake Concord Park. Holiday entertainment will delight visitors from 6 to 7 p.m. followed by a tree lighting at 7 p.m., then the movie in the park, Rise of the Guardians will run from 7:30 to 9:30 p.m. Bring the family for Santa, artisan booths, a Food Truck Bazaar and more! For more information call 407-262-7700, ext. 1507. DEC. 14 Its the Oviedo Winter Springs Holiday Parade and Snow Mountain The parade gets going along Ovie do Mall Boulevard at 4 p.m. heading toward the mall, and the Snow Mountain plus games, music and more wait at the end. Its from 3:30 to 9 p.m. Dec. 14 at the Oviedo Mall parking lot, so theres plenty of parking. ONGOING The Emil Buehler Perpetual Trust Planetarium at Seminole State College offers Central Florida the chance to celebrate the holidays with multiple perfor mances of its most popular show. The Planetarium will present The Star of Bethlehem 10 times this season, with two showings each on Dec. 6, Dec. 7, Dec. 13, Dec. 20 and Dec. 21. Show times for each date are 7 p.m. and 8:30 p.m. The Star of Bethle hem looks at how the calendar system has changed over the millennia and examines clues from the Bible to pin down the birth year of Jesus under our current calendar. The origins of the Magi are then looked at to determine what celestial phenomena they would have most likely interpreted to be the Star. Light Up UCF runs through Jan. 5, the event features 50 nights of music, lights, and ice, with ice-skating, ice slide, and a winter carnival atmosphere. Visit ligh tupucf.com for more information and tickets. Page 8 | Dec. 6, 2013 | Seminole Voice AT HLE T I C S THIS WEEK IN SPORTS HISTORY DEC. 7, 1980 Upcoming Events For more info and to register for events go to: www.OviedoWinterSprings.org December 9th Young Executives Holiday Social 5:30 7:30pm, Spill Wine & Beer in Winter Springs Are you a young executive under 40? Are you currently looking for new networking opportunities? Come join this unique opportunity to network and mingle with young C Level executives. This month we will be hosting a Holiday Social. Our speaker is Esther Vargas Davis from the UCF Incubator program. December 11th OBN Holiday Party 5:30 8:00pm, Tuscawilla Country Club Join the ladies of Oviedo Businesswomen's Network for their Annual Holiday Party! The ladies will celebrate the evening with plenty of dancing and Christmas in the City. December 14th Snow Mountain and Holiday Parade 1700 Oviedo Mall Blvd Oviedo FL 32765 Join us in celebrating the season at the OWS Chamber Holiday Parade! Enjoy marching bands, floats, dance groups, choirs, vehicles and then visit the Snow Mountain! Parade will start at 4:00pm and Snow Mountain will be open until 9:00pm. We hope to see you there! December 19th Chamber Knight at Light Up UCF Join the Chamber at this years Light Up UCF event. Light Up UCF is a great family event with an 8,000 sq ft out door skating rink, rides, and holiday attractions. This year it is snowing every night and they will be showing a different holiday film each night! We hope to see you there, and make sure to stop by our info tent! For Tickets Call 321.268.1125 Or Visit www.TitusvillePlayhouse.com Presented through special arrangement with Tams Witmark, NYC The Knights are at their highest ranking of the season after yet Nov. 29. in a chilly thriller in the Bright driving deep into UCF territory pass and sent the tense crowd accompanied by a collective sigh of relief in a game in which the USFs scores. OLeary said in a press conference after the game. It had had won a game in which they highest the team has ever been the same week the BCS standings slowly moved their way into Their slow and steady rise has games this season in which they were the favorite or the heavy attempts against rival USF was than expected Nov. 29 as the UCF UCF ghts to clinch rst BCS bowl berth ISAAC BABCOCK The Voice Please see KNIGHTS on next page PHOTOS BY ISAAC BABCOCK THE VOICE The Knights barely edged USF in their last game, but clinched a share of the AAC title. With a win over SMU this weekend, theyll head to a BCS bowl. Page 7 Lets face it too much of the coverage we provide from Washington is inside base ball, easily ignored by those who live in the real world. Sometimes, though, this stuff matters. A case in point is the decision by Harry Reid and his Democratic gaggle to invoke the nuclear option. Its called that because Reid and his partisan majority blew up ing a parliamentary maneuver, they were able to circumvent the usual two-thirds vote nec essary to change the rules and used a simple majority to do away with the biggest delaying the deliberative United States Senate. Republicans are having a cow. Youll regret this, sput tered Minority Leader Mitch McConnell. The solution to this problem is at the ballot box. He was trying to make the obvious point that if the Rs take over, its the Ds who will have lost their power to stop a conservative agenda. Unwittingly, however, Mc Connell was offering a justi a stalling tactic that he and his partisans were using to thwart the winner of the last election. The voters choose who will head the nation. Last time around, that was Barack Obama, meaning he gets to on the federal bench, and also who will head the departments and agencies of his adminis tration. Forgive the civics refresher, but while the Constitutions advise-and-consent power provides the Senate an abil ity to block nominees, it is supposed to be used sparingly. The key word is consent, but at an unprecedented level, the judicial and executive appoint ments put forth by President Obama. It came to a head when they blocked three of his openings. The Republicans were daring Reid to make the nuclear move in truth, they triple-dared him so he did. Actually, it wasnt a com is an exception for the Su preme Court nominees, and it still can be deployed to shut down legislation. That brought some criticism from those who believe that the GOP agenda is all about obstruc tion. If Barack Obama asked Congress to approve a Happy Thanksgiving resolution, it upper chamber. Republicans vow revenge. They have plenty of tools for continuing the gridlock. The Senate rules are packed with delaying tactics. So they can retaliate against the nuclear option with the death of a thousand cuts. The budget deals that need to be done, for instance, can be sunk if they simply refuse to negotiate. Depending on how vindictive they choose to be, we could be facing another govern ment shutdown or debt-ceiling crisis. If youre wondering just what all this has to do with running the country, the answer is nothing. Those on the right point out that when theyve held the power, the liberals have also embraced procedural block ades. But the Republicans have reached new highs. Or would it be lows? In the ugly world of politics, things rarely improve they get worse. Inside baseball? Yes, it is, but the game affects all of us. If the legislative branch can substitute political pettiness for law making, we will con tinue to deteriorate. Thats not what a democracy is supposed to be. 2069 Aloma Ave. Winter Park, FL 32792 762 E. Altamonte Drive Altamonte Springs, FL 32701(407) 691-3009 (407) 679-2135 Visit us on the web @ www.binsons.com r fntbt f rtt ftbt bt bnr nr rt b bb f b tb off trtnCoupon redeemable for cash, check or credit card purchases only. Not redeemable for insurance transactions. Excludes custom/special orders & nutritional supplements. May not be combined with any other dis counts. Coupon has no cash value. New Holiday Merchandise! Nuclear matters: War on the Capitol oor ASSISTED LIVING RESIDENCE 395 Alafaya Woods Blvd., Oviedo, FL 32765 407-977-8786ALF License No. 9235, 9308, 9307 www.slm.net/SCOviedo1 Signature property of Located on a beautiful campus setting, our two Savannah Court communities provide full assisted living services while Savannah Cottage offers a secured residence for those with memory loss. Call us today, stop by for a visit, join us for lunch, or all of the above! You are always welcome at Savannah Court and Cottage of Oviedo. MEMORY CARE RESIDENCEWhere hospitality is truly a way of life! Savannah Court and Cottage ASSISTED LIVING RESIDENCE 395 Alafaya Woods Blvd., Oviedo, FL 32765 407-977-8786ALF License No. 9235, 9308, 9307 www.slm.net/SCOviedo1 Signature property of Located on a beautiful campus setting, our two Savannah Court communities provide full assisted living services while Savannah Cottage offers a secured residence for those with memory loss. Call us today, stop by for a visit, join us for lunch, or all of the above! You are always welcome at Savannah Court and Cottage of Oviedo. MEMORY CARE RESIDENCEWhere hospitality is truly a way of life! Savannah Court and Cottage Located on a beautiful campus setting, our two Savannah Court communities provide full assisted living services while Savannah Cottage offers a secured residence for those with memory loss. You are always welcome at Savannah Court and Cottage of Oviedo www.savannahcourtoviedo.com395 Alafaya Woods Blvd., Oviedo, FL 32765407-977-8786 Call us today, stop by for a visit, join us for lunch, or all of the above! Page 8 DEAR PAWS CORNER: I have two dogs and a cat, and I love them all dearly. I also try to make things a little better for pets that dont have homes by helping out two days a month at the local shelter. Please let your read ers know that they can make a huge difference in dogs and cats lives even with a small contribution. If they cant give their time, they can donate money, food or other pet-care items. Caring in Kalamazoo DEAR KALAMAZOO: You told them, and thanks! The holiday season offers the most opportunities to donate, no matter what amount, to a pets. So while youre busy making gift lists and holiday preparations, dont forget to include pets in need some where in those thoughts. Most local shelters have Web pages online where you fundraising events, see what food or supplies are needed, email address to learn more. Those that dont have a website often have listings or dedicated space in the town or community newspaper. Major pet-care organiza tions and pet-supply stores have fundraising drives throughout the year, while local organizations sometimes hold supply drives and other events with the help of local businesses or municipalities. You also can donate your free time to help out at local animal shelters. Contact your nearest shelter to see if op portunities are available, how much time is required and if additional training is needed for certain volunteer posi tions. Send your questions or comments to ask@pawscorner.com. Did you know mosquitos can transmit heartworm lar vae to dogs, but eas dont? Find out more in my new book, Fighting Fleas, available now. 2013 King Features Synd. Inc. Remember pets in need this holiday season will be celebrating mass starting at1300 N. Mills Ave.(Mills and Montana, just north of Colonial Dr.)Mass begins at 11 a.m. Casual attireParking is along Mills and in Watkins Dental parking lot. Please visit website for information HEAR YE ... HEAR YE! shadow.indd 1 5/1/12 3:22 PM shadow.indd 1 5/1/12 3:22 PM shadow.indd 1 5/1/12 3:22 PM here should be more to life than maintenance-free living. To learn more about our community in Kissimmee, call (407) 933-1999.